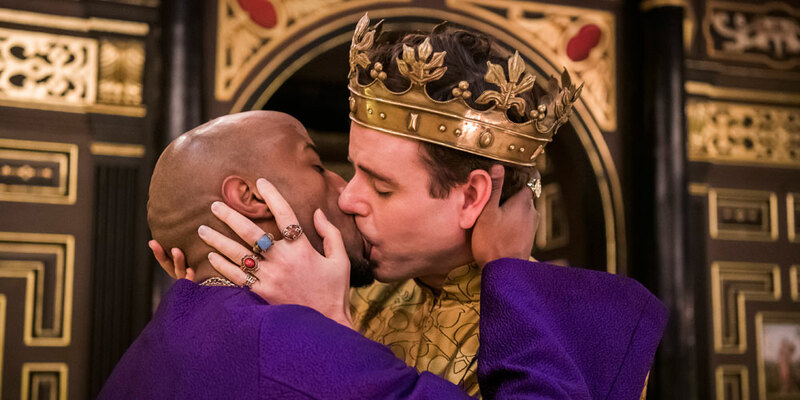 There is an esoteric charm to the writings of Christopher Marlowe and with masterful direction by Nick Bagnall and a beautiful stunning set by Jessica Worrall, the Sam Wanamaker Playhouse stage was set for a brilliant adaptation of the story of Edward II. By using just candlelight, the atmosphere was superb creating shadows, areas of light and shade and because the actors also came into the audience to deliver various speeches, this was completely immersive theatre. Edward II is a medieval soap opera. It has everything in it: lust, revenge, double crosses, snobbery, plot within a plot, family disloyalty, manipulation, power struggles and the need to be loved. With a cast headed by a very watchable Tom Stuart as the eponymous King, the twists and turns are played out with gusto. There was admirable support especially from Richard Cant playing the joint roles of the Earls of Leicester and Lancaster, Jonathan Livingstone as Mortimer Senior, and an incredible tour de force from Colin Ryan playing the Bishop of Coventry, Spenser Junior and Prince Edward. Beru Tessema superbly played Gaveston, the male lover of the King, with true conviction. The passion and power of this Plantagenet King is vividly brought to life and the intrigue and treachery of a quarrelling court of the time is examined in very fine detail. An absorbing history lesson.